Most of the software for the HP 9845 was distributed on DC100 tape cartridges. This was the standard way since the tape drives were already part of the standard HP 9845 configuration. At design time this was a quite useful decision. The DC100 was small, fast, reliable and comparably cheap. And it had a very good storage per volume ratio. However, neither the tape drive nor the tapes themselves were built for eternity. Both are "time bombs" since it is not a question if they fail but just when. An estimated 90% of the tape drives today suffer from 'melted' capstan coatings. But even worse, a considerable amout of original HP tapes, especially those which were used as original software distribution media, have lost parts of their magnetic coating, causing dead spots on the media. No question that it is overdue to save all the software from tape to more durable media. This applies to original commercial software as well as to individual saved programs and data. Since the original software probably is of higher common interest, there is a special section for HP 9845 software here. How to repair your internal tape drive is described in the Tape Drive Repair Tutorial. This tutorial has its focus on the tapes, not on the tape drives. In order to understand how to get access to the data on the tapes, it might be useful to know how they work. There is an excellent description of the history of the DC100 tapes at HP9825.com, it is worth reading. The DC100 was based on U.S. patent no. 3692255 from 1972 (you can find it here for download) and developed in a joined venture of Hewlett Packard with 3M Corporation (who already used the patent for their DC300 tape cartridge). The mechanism was admittadly ingenious. Simple, precise and reliable. The design was applied to most data tape drive mechanisms as for the QIC standard or the DC600 tapes, and is still in use. 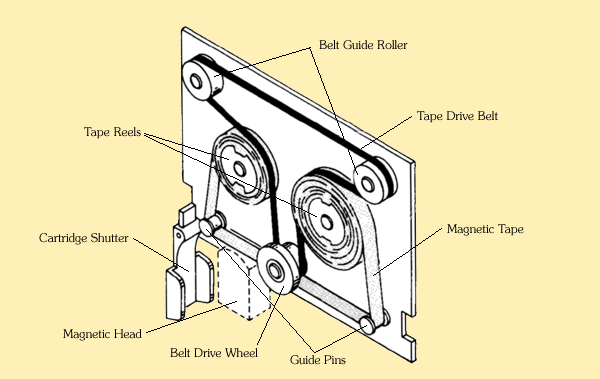 The basic principle is that, in contrast to a plain compact cassette as it is used for audio recording, the whole tape movement is controlled by one single puck-like drive wheel. All movement is transferred from the drive wheel via a drive belt. Only one single drive motor is needed. The tape itself is spooled on two tape reel hubs and guided over two guide pins. The drive belt is wrapped around the tape spools and guided around two belt guide rollers as well as around the drive wheel. 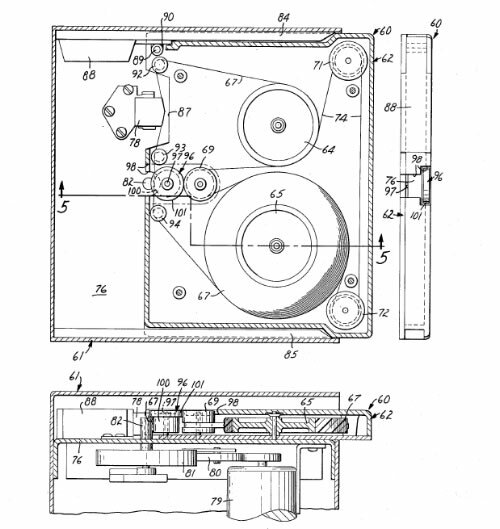 Once the drive wheel is brought into constant rotation, the drive belt moves each tape spool exactly the amount which is needed to spool the tape from one reel hub to the other with the desired constant tape speed. The whole mechanism is completely closed and mostly secure against dirt and dust. A shutter opens the cartridge for the read/write head automatically when the cartridge is inserted into the tape drive. 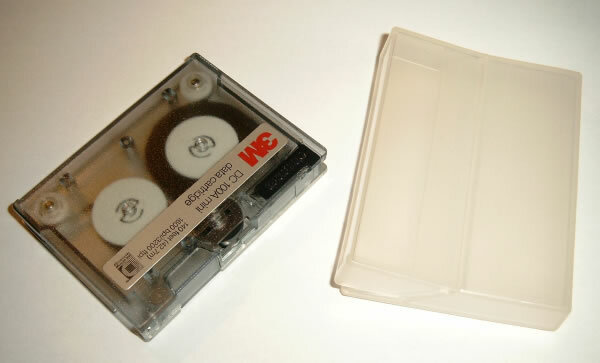 The design includes a slider for write protection (which is not necessarily included in all manufactured DC100 tapes). The DC100 tape medium has the same .15" width as the compact cassette, with tape length 140 ft. (42.67 m). So the tape had been much narrower than the common ½" used for 9 track magnetic tapes an even narrower than the ¼" of the QIC tapes. The defined data density for the DC100 was 1,600 bpi with two tracks. The tape is loosely spooled onto the reel hubs (means that in contrast to the audio compact cassette the ends were not fixed to the reel hubs). The mechanism is secured against tape runoff through a couple of index holes (so-called beginning-of-tape or end-of-tape marker) at both tape ends in combination with a photo sensor. At the beginning of tape there are 3 double-holes and one single hole, at the end of the tape there are four single holes, all with defined distances. The first single hole marks the beginning of data and therefore will be used for head positioning, too. If this mechanism fails, the tape will spool off and, if the data on the tape is of importance, must be re-threaded. There is a special procedure for tape re-threading available here. In principle, the tape will be retensioned automatically during normal operation due to a slightly faster coiling than uncoiling. In fact the retension process highly depends on the characteristics of the tape, the drive belt, the belt guide rollers and the tape guide pins. Those characteristics include factors like rotation resistance, adhesion and belt tension and elasticity, which sometime is out of specification due to aging. As an example, some old tapes fail to retension properly because the elasticity of the drive belt has gone or the consistance of the lubricant which was used to control the adhesion at the guide pins has changed during the years. Briefly said, the correct tape tension depends on a perfect balance of all components. How deep the cartridges are affected by aging depends quite a lot on the manufacturer. HP's own media had been highly optimized at production time, but suffer most from aging. Estimated 80% of all HP DC100 tapes can't be used without problems. In contrast, the latest tapes produced by 3M still have a (comparably) high reliability. Scotch is anywhere in between. Unfortunately, most original software was stored on original HP media. 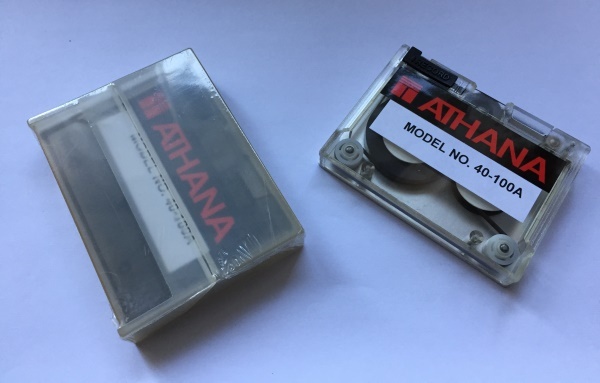 If you need brand new DC100 tape cartridges, contact Athana (http://www.athana.com/), they still manufacture DC100 cartridges Athana claims to be compatible to those used in the HP Series 80 systems (for some price, of course). I did a first try with those Athana replacements. Although they are mechanically compatible, I get a number of read write errors, which suggest the magnetical characteristics are probably optimized for the Series 80, but not for HP 9845 (which uses different analog circuits). Possibly the 9845 tape drives can be adjusted by replacing certain (pluggable) resistors to get them working with the Athana tapes. For further reading, the May 1976 issue of the HP Journal is recommended. Although the tape drives introduced in this issue are those of the 2644A terminals, the basic principles of the DC100 tapes which are described in detail apply to the 9845 series as well. The DC100 tape was introduced in 1975 with the HP 2644A terminals. Those early built-in drives did use only one track on tape (mainly for reliability reasons). The 9815, 9825 and the 9835/9845 all use two tracks. Since the read/write head has one coil for each track, the track can be changed on the fly without removing and turning the tape cartridge. All data is modulated into flux reversals which represent logical 0 and 1. In order to use a tape for mass storage operations, the factory new tape has to be low-level formatted with the INITIALIZE command. This low-level format writes a basic frame structure on the tape, which is a bit different for each system. Whereas the 9815, the 9825, the series 80 and the peripheral 9875A dual tape drive all utilize SIF (Standard Interchange Format), this was sacrificed for the 9845 for the sake of a so-called Unified Mass Storage Concept. Not much is known about the low-level tape structure of the 9835/9845, since the TACO (Tape Control) chip does most of the work. Better documented are those of the HP 2644A terminals or of the 9875A dual tape drive. Both use a file and a data record structure with defined inter-record-gaps. The 9845 uses a data record structure only, with the record number and a checksum stored into a record header. There is no buit-in support for reading SIF tapes in the 9845 OS firmware, however there is a special SIF binary program provided as part of the 9845 General Utilities package as well as of the 85 to 9835/9845 Data Utilities package, which implements the most important commands for reading SIF tapes even in 9845 tape drives. During seek operation the tape drive switches into fast spool mode with 90 inches/sec and only looks at the record headers with the record numbers. When the searched record is found, the tape drive switches to slower read/write mode with 22 inches/sec in order to reliably read/write the data into the record. Each record holds 256 bytes of user data. There are 426 records on each track, giving a total capacity of 852 records or 213 kBytes. The first 5 records on the first track are reserved. The first record (record 0) is not used. The next 2 records hold the directory information and the following 2 records hold a spare copy of the directory, just for the case the first directory is not readable. So the space available for file data is limited to max. 847 records or 211.75 kBytes. Each filename may have up to six letters. Only the upper 6 bits of the type byte hold type information, the lower 2 bits are used as MSB for the location which has to be combined with the content of the location byte as LSB. Both the location and the size refer to whole physical records, i.e. blocks of 256 bytes. The wpr byte denotes the logical number of words per record for the file, also referred to as defined record size (in contrast the the physical record size which is always 256 bytes on tapes). The last valid file entry is immediately followed by the two-byte hex value $FFFF, which therefore marks the end of the directory. I have not yet figured out where the file protection information is being stored, this is for further study. There are two ways how 9845 software can be archived on a PC, either file by file (which is in principle media independent) or as complete media content (so-called binary images). At hpmuseum.net the first method is used, mainly because there is no way to produce 1:1 images from the original software tapes. Instead, the tape content first was copied to a 9895A floppy disk drive, which is then swapped to a 9826 workstation, where the files are transferred to 5.25" floppies. The 5.25" floppies are then moved into a standard PC floppy drive and archived with the Teledisk program. The guys from hpmuseum.net did a quite good job and archived in this way many of HPs standard software packages. The main problem is, that you need a PC with Teledisk, plus 9826 or 9836, plus 9895A in order to restore the files, and due to limitations of the 9826 operating system not all types of files may be archived and reconstructed in this way. I suggest using the other approach, i.e. to save whole media content. The main advantage is that floppies, tapes etc. may become completely reconstructed, including all file system information. The drawback is that you need an additional tool to extract individual files from the image. However, there are a couple of tools which can be used to handle the image format I am using, especially the HPDrive program to emulate an HP-IB mass storage on PC while using an image file as disk storage, and the HPDir utility to extract files from or to add files to images. The format I've chosen for image files is absolute generic. It is just a 1:1 reproduction of the mass storage physical records without any extra information. For floppy disks this covers the complete sector content in ascending order including the system sectors, for tapes the complete data content of both tracks, again including the system records. I gave them the file extension .hpi, which stands just for 'HP Image File'. There are even plugins provided for the well-known Total Commander for this type of archive/filesystem. Since the image format itself is completely system or device independent, LIF disks or tapes can be archived as well as any other vintage disk or tape content. HPDrive plays just the role of the drive hardware and firmware, the media is completely emulated with the image file. There's a conversion utility provided to translate the Teledisk images from hpmuseum.net into the .hpi image format (see the Software Packages section), and I plan to make those translations available for download from this site in the near future. However be aware that some of the original tape files are missing, and some double-sided media have been recorded with Teledisk in single-side mode (e.g. the 9845A Computer Games), which makes them unusable. For reading the tape content record by record and creating .hpi image files there is a special 9845 program provided, wich does most of the job (its name is Tapetool/45, I wrote it especially for the handling of tapes suffering from bad spots on the magnetic coating). Tapetool/45 and how to use it is described in the following sections. I just started to read out the tapes by myself, so there are also a few packages available for download which are true images from the original media. It is planned to save some more in the near future, and actually I hope there are also others who will submit what they saved using the utilities provided here. It is true that an .hpi image file may become much larger than the sum of the file contents, in particular if there is much unused space on the media. But if you just ZIP the image files, they in general collaps to a size comparable to an also zipped archive of the files only. When I've got the time maybe I create a compressing format as well (I'll call it then .hpz). There is either another mass storage device available (e.g. a 9895A floppy drive) or there is a working HP-IB connection from the 9845 to a standard Windows PC. The external mass storage device (or alternatively the HP-IB link to a PC) is needed both for loading the tape read program and for storing the tape data. How to connect to a PC via HP-IB is decribed in another tutorial, the Connecting to the PC Tutorial. Whether the tape drive is working you should already know (at least after consulting the Tape Drive Repair Tutorial). But be warned. If only one of the above prerequisites is not fulfilled, saving tape content may become a REALLY ugly and time consuming procedure. The most common problems are "bad spots", sticky guide pins and drive belts with too little tension. It is recommended to read this complete page before starting tape dumps in order to get familiar with likely problems and their solutions. Handling tapes is more secure and more relaxed if you wear latex gloves. You should always avoid touching the surface of the tapes with your fingers. The most important action is to prevent tape damage for a tape that has been stored for a long time. During storage, the drive belt tends to bond to the tape. Any tape movement then might take off the magnetic coating from the tape carrier, because adhesion to the drive belt is higher than to the mylar carrier. A way around this is to use hot air (e.g. from a hair drier) to heat up the drive belt, so that the drive belt loses its adhesion to the tape (thanks to Rik for the hint). There are sophisticated methods to "bake" the magnetic coating back to the mylar carrier, before it gets off during the next use. This is common practice for professional tape recovering. If you have a really valuable tape, I would always recommend utilizing such kind of professional offers. But it has its price. There are reports around for doing that on your own in a standard oven, but I never did it by myself, so I cannot give you any advice on this. 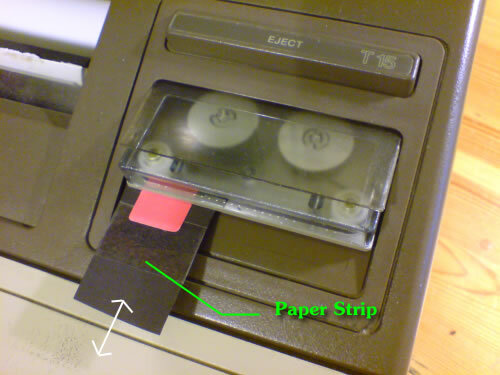 So, if you are using a tape that has been stored for an unknown period of time, don't try to move the tape, but first open the cartridge (see the Opening and Closing a Tape Cartridge section below how this is done), and carefully heat up the drive belt with hot air until it changes its color to black over the full length of the belt. Then - carefully - remove the drive belt (take care not to touch the tape surface or to rip the tape off the coils). Using a toothpick as a tool makes it easier. Inspect everything that is within the path of the tape. If required, clean with isopropyl alcohol. Don't clean the tape itself, and I also would recommend not to clean the guide pins, unless they show abrasion on them. Then re-install the drive belt (see section Re-installing a Drive Belt below) and close the cartridge. If something went wrong, and you e.g. tape has fallen off the coils, don't panic - unless the tape itself is damaged, there is always a way to get things into order again. Even a drive belt may be replaced from a good cartridge (it is reported that Plastibands also may be an option). Check whether the tape is rewound to its starting position (you should keep this in mind - if the tape is not rewound, probability is high that you will have bad spots at the current position due to contact between tape and drive belt/rollers). Try to move the tape by opening the cartridge shutter and moving the drive puck wheel (use the eraser for this, avoid touching the tape with your fingers). If the tape is moveable, insert the tape into the functional tape drive and press REWIND. If it can't be moved, stop operation, open the cartridge and see what's wrong. When the tape stops after rewind, remove the tape from the drive and take it into your left hand with the shutter up and away from you. Open the shutter and hold it open with your left hand. Again be careful NOT to touch the tape inside. Use the rubber to move the drive wheel in the center of the cartridge in your direction. You should see an index hole in the tape moving away from you. If not, you should see a transparent area on the tape. If this is the case, your tape has at least one bad spot (you just detected it). If you identified the index hole correctly, keep on moving the drive wheel for another, say, 20 rotations of the tape wheel. If you still don't encounter any transparent areas on the tape (ignore additional index holes), the first impression of the tape is positive and you can stop here. The next step would be to load the tape utility Tapetool/45 on the HP 9845. This is a 9845 BASIC program I have written for several operations on the 9845 tape cartridge subsystem, including saving and restoring low-level tape contents. Tapetool/45 uses a binary routine called PHYREC for reading and writing physical sectors (works with any 9845 mass storage). With Tapetool/45 you can position the tape to a specified record (including re-spooling), dump or restore full tracks, selected records or single files, verify tapes, produce 1:1 copies from tape to tape and list tape directories. Tape dumps can be either stored as binary images on another mass storage medium, or transferred via a HP-IB link to a PC (and vice versa). (the latter two are currently limited to certain IEEE488/GPIB boards, see the appropriate section under the Project tab for program usage and which hardware is supported). The receiver program has to be ready before the transfer is started within Tapetool/45 from the 9845 side. Tapetool/45 can be started on the HP 9845 e.g. by mounting the 9845 utilities hpi-image with HPDrive and then LOADing and RUNning the file TTOOL. See the Download section below for the 9845 utilities image, and the HPDrive section for more information on mounting images. If you selected expert mode, you will start with the default configuration, which is T15 as source drive, HP-IB transfer to host address 20 and no printer logs. You can change these settings any time via restart or by selecting the "Change configuration" function from the Tapetool/45 menu. Normally, system errors are all caught by Tapetool/45, translated into readable error messages and handled correctly, so that no program termination will occur. However, for yet unknown reason, sometimes catching the errors fails, and Tapetool/45 terminates or simply 'hangs'. In that case, do a CONTROL-STOP to re-initialize the HP 9845 I/O system, restart Tapetool/45 and repeat the last procedure. If the tape stops before the end of the tape is reached, examine the tape for bad spots, position the tape manually behind this bad spot, and again use the position function to continue to record #425. Repeat this for every bad sport until the end of the tape is reached. If the end of the tape is reached, insert the strip (for skipping any bad spot) and use Tapetool/45 to position to record #0. If there are no errors and Tapetool/45 reports "Tape now positioned at record 0", the tape is now ready to get dumped. If errors occur, or the tape gets unspooled, it is likely that record #0 is defective. In this case you have to position the tape manually before the first record. 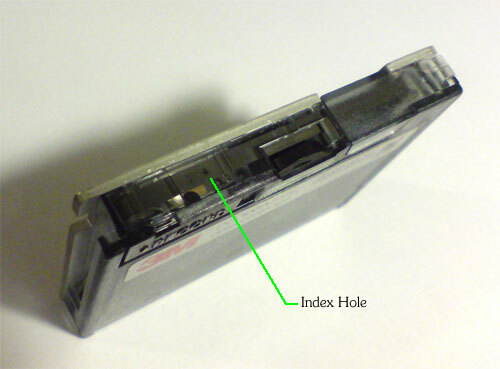 You have reached the right position when the single index hole is visible in the mirror window of the tape cartridge (see the picture in the section below). With a healthy tape, this is automatically the case after each rewind operation. Tapetool/45 uses a special buffering method to read as much data as possible in one single pass. So tape stops get minimized and the tape does not get stressed as much as the single record access does. It can happen that one or more records cannot be read (faulty address mark, checksum fails etc.). Normally, Tapetool/45 does three retries on such records and in case of failure outputs an error message and replaces the (corrupt) data for faulty records with a "BAD RECORD" string, followed by zeros. This simplifies to identify bad records later on in the image file. If you like to dump whatever the tape drive returns even for bad records, you can disable this feature, but you have to consider that your image file then may contain corrupt data which is not marked. It is always a good idea to clean the read/write head using magnetic head cleaner and to re-spool the complete tape prior to each dump. It is also a good practice to dump each tape at least twice and perform a binary compare on the resulting image files. Due to the age of the media and despite of the checksum, it is not uncommon that some image sectors hold bad data caused by undetected read errors. However the chance is good, that the same sector is read OK on the next dump, so that the defective sector can be at least theoretically be replaced (you can use a binary editor to replace the bad records manually, byte address is always record # times 256). However, there are situations where you definitly need two or even three identical tapes in order to reconstruct the complete original tape data. 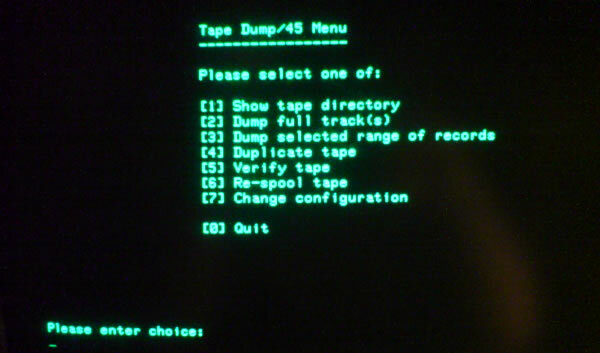 If everything went right, the tape is positioned just before the first record, and either an external mass storage device is available or the GPIB receiver program on the PC is ready, then use the "Dump or restore full track(s)" function from the Tapetool/45 menu to dump the whole tape content. You can select either dumping the tracks separately or in one single pass. Single pass is only recommended for known good tapes, in all other cases, you should dump each track separately. Once you have positioned the tape at record #0, do not unneccesarily remove the tape from the drive before the read starts. The 9845 remembers the last positioning and does not search again for record #0 when starting the read process. This memory is lost when the tape cartridge has been removed, and the tape must be positioned again. Each time before rewinding the tape (e.g. for reading the next track) remove the tape cartridge from the drive and move the drive puck wheel slightly manually forth and back. After a reading a whole track, abrasion has aggregated at the guide pins and often the tape is stuck, which may then lead to torn drive belts since the capstan immediately applies full force to the wheel. By moving the tape slightly manually, it gets moveable again. If required, open the cartridge and clean the guide pins before continuing with the rewind. If there are "bad spots" on the tape, you need to use the paper strip method (see the "The Bad Spot Problem" section below), this may lead to unspooling tapes, even if you are experienced with this method. If that happens, don't give up, rethreading tapes is annoying but feasable (see the appropriate section below how this can be done). Always monitor the tape movement. If something unusual happens during the read process, like tape transport stucks, or strange sounds like tape jam, immediatly press CONTROL-STOP (this is the only way to abort ongoing tape read processes), remove the tape cartridge from the drive and check what has gone wrong. Movement for tape reading is slower than for rewinding. In order to re-tension the tape during read process, it is normal that the tape controller does intermediate fast rewinds during the read process (this is also called "conditioning"). This happens usually three to four times during a whole track read. Also ignore read error messages, Tapetool/45 tries to read the good records in any case. If you discover uneven tape spooling, stop the process (again with CONTROL-STOP) and examine the tape and especially the drive belt (you need to open the cartridge for this, see another section below). If the problem persists, you should exchange the drive belt against another one with proper tension. If you like to terminate operation (e.g. due to numerous read errors), press STOP or CONTROL-STOP and, if neded, restart Tapetool/45. Note which records produced read errors. In case you like to re-read only those bad records, you can use the "Dump or restore selected range of records" function from the Tapetool/45 menu. If reading those sectors was successful, use a binary editor to paste those good sectors into the image file (byte address is record # times 256). 80 Cartridge out Cartridge out or door open. Also can be an indicator that the ribbon cable connection between the drive and the system is not working properly, in which case the 'cartridge loaded' signal is not recognized to the system. 81 Tape device failure Tape device failure. When performing tape dumps, this mostly is an indicator for bad spots on the tape. See the procedure in the Bad Spot Problem section below. 82 Tape device not present Device not present. Check you selected the right tape drive (:T14 or :T15). Check ribbon connection between drive and system. 83 Cartridge write protected Write protected. Check write protection on the tape cartridge. 84 Bad spot on medium Record not found. Either the tape has not been formatted, or a bad spot has been encountered (see the procedure in the Bad Spot Problem section below). 85 Tape not initialized Tape not initialized (=formatted), or the record structure has errors. 86 Incompatible tape format Not a compatible tape. Probably the tape was formatted for another system (e.g. 9825 or Series 80). 87 Bad address mark Record address error. The current record has no valid address mark, so the drive can't derive the record number of that record. 88 CRC error Read data error. The checksum (CRC) for the current record does not match with the data read. Either the data is currupted, or the CRC. 89 CHECK READ error CHECK READ command failed. 90 Tape device system error Tape system error. to combine them into a complete tape image fulltape.hpi. Size should be 426 records x 2 tracks x 256 bytes = 218,112 bytes for a complete tape image file. If everything worked well, you are really lucky, since for original tapes this is definitely the exeception. The following sections cover some of the most frequent problems you have to deal with during tape dumps. It is recommended to get familiar with both symptoms and procedures before starting to dump your valuable tapes. Both effects can be highly destructive. Uneven spooling may cause tape jam or block tape movement. Tape movement is also blocked when the tape stucks at the guide pins. Tape jam will damage the tape medium, and tape stucks may be the cause for worn drive belts or even motor damage. So if you encounter either tape garbage or blocked movement, IMMEDIATELY press CONTROL-STOP in order to prevent even more damage, remove the cartridge from the drive and treat the problem. The probability of uneven spooling can be minimized by re-spooling the tape completely before each dump. This can be done with the appropriate function in the Tapetool/45 program or the TBIN test binary. Tape stucks can be minimized through a continuous read process. This is important, because numerous tape stops during tape reads will multiply the chance to get into tape stuck (a symptom for missing lubrication is a hearable 'tick' each time the tape starts another move). This is addressed by the buffering feature of the Tapetool/45 utility. Unfortunately, it is not possible to avoid tape acceleration/deacceleration completely, since the read data has to be minimum processed between the block reads. Most original software tapes have a common problem: the magnetic coating has become defective at certain spots. The tape is mainly constructed with two different layers, a transparent vinyl carrier and a gray/brown magnetic coating. When the coating gets loose, the tape has visible transparent spots. The original tapes manufactured under HP label are more affected than those from 3M or Scotch. During years of storage, the tape sticks to the rollers and the drive belt, and it can happen that the coating gets removed from the original carrier during the first usage after long storage. But there can be more bad spots on a tape. They are likely to be in the area of the first meter of tape, but they can occur anywhere, e.g. if the tape was not rewound before storage. The best way to store tapes safely probably is to unspool them completely before storage and respool them before next use. Professional tape recovery services use special treatment to separate the coating from the drive belt and rollers before moving the coils and are capable to "bake" the coating back to the carrier. The problem with the bad spots is two-fold. On the one side, the absence of magnetic coating causes data errors, on the other - since the carrier is transparent - the photo sensor detects index-'holes' and assumes end-of-tape each time a bad spot passes the sensor. The general rule is: it is better to save as much data as possible and leave the rest, than to save nothing. With a little luck there is another, identical tape, where the bad spots are at another position, so the original content may be completely reconstructed by merging the two. But the photo sensor allows reading just up to the very first bad spot and then drive transport stops (since it thinks it has encountered the tape end). Even rewinding to the start of tape is a problem, because the photo sensor may think it has reached the tape start when it runs on a bad spot during rewind. The art of tape reading is now to insert the strip at the right time during the tape transport (so that bad spots are ignored by the photo sensors) and to draw the strip out when the real end of tape is near, so that the tape will not be accidentally run off. The mark on the strip is ment as help for drawing out an already inserted strip. When the mark is visible, the light path will be free. Once the reading process has successfully started, this method works fine. The problem is to get it started when the bad spots are at the beginning of the data section. The tape transport then makes some movements back and forth in order to find the data start. When there are bad spots near this position, the tape transport gets completely confused and starts moving coninuously back and forth (which can only be interrupted be pressing CONTROL-STOP). If this was NOT successful (Tapetool/45 can't find record #0 or tape gets unspooled) on several tries, you just can try positioning the tape manually and try to start the read process and hope that it works. It is a good idea to practice a bit with a not-so-important tape cartridge to get a feeling when the tape is moving back (where using the strip may lead to running off the tape) and moving forward (where it is safe to interrupt the light path, at least until the tape transport switches to backward move again). By the way, there is a nice description for tape re-threading here. By the way, since Tapetool/45 detects the last record and therefore in most cases never reaches the end-of-tape hole, it is quite unlikely that the tape gets unspooled at the other end, even with strip inserted. You can check whether the movement stopped at an index hole or at a bad spot only by removing the tape from the tape drive and opening the cartridge shutter as described above. You can manually forewind the tape by moving the drive wheel in your direction, or rewind the tape by moving the tape drive wheel in the opposite direction (away from you, you than can see moving the tape towards you). Move the tape about 10 cm behind the transparent area, then re-insert the cartridge and continue with spooling until the next stop is reached. If you encounter an index hole during manual spool, position the index hole exactly under the cartridge mirror window as shown in the drawing below, then stop (the cartridge now is in perfect position for the next operation). If you decide to use this technique, you'll need to practice until it works well. In any case it is a good idea to make yourself familiar with re-threading a runoff tape (see here how it works). The Tapetool/45 program tries to assist you in terms of telling you when to insert the paper strip and when to move the tape manually. The whole procedure isn't perfect at all, but at least there it is minimal invasive and lets you read any data which is still readable. In order to avoid additional bad spots in the future, once the tape has been dumped, you can unspool the tape for storage, so that the data area between the index holes will not have contact to any other parts of the cartridge. Rethreading the tape when needed is a simple and safe procedure. There are even more things which can go wrong with the tape (not taking into account what in addition can go wrong with the tape drive hardware). It is generally not recommended to touch the tape surface. Best solution would be to wear gloves. Second best is at least to degrease your hands before you start. However, if you do such tricky things as re-installing a drive belt or re-installing the cartridge shutter there is no chance to afford that with gloves. The only tools required are a Philips screwdriver for opening the cartridge, a non-sticky vinyl or rubber for moving the drive wheel, and, last but not least, a couple of toothpicks for handling the tape and for comfortably moving the tape reels, and maybe some adhesive tape for fixing the shutter. Cleaning is best dobe with a cotton swab (for cleaning the read/write head in combination with magnetic head cleaner). Happens generally when the tape blocks for whatever reason, and also when the drive belt has too little tension. Try re-installing the drive belt (see the procedure description below). Experience shows that the drive belt suffers from aging and if it is lost too often, it may tear. So have another cartridge at hand with less important data where you can 'borrow' the drive belt if needed. Happens mostly if the drive belt has too much tension, but can be caused by simple aging or missing lubrication at the guide pins as well (causing tape stucks). Once the drive belt is torn it must be replaced. There is no way to repair a drive belt. Take another one from another less important cartridge (ideally from a cartridge which has already successfully saved and/or has unreadable data). Happens when there is too little adhesion at the guide pins or the drive belt has too little tension. Open the cartridge and re-arrange the tape, as far as it is possible. Transfer the whole tape to another cartridge where the guide pins and the drive belt are OK on the very first tape jam. Tape jams are very bad because the chance is high that the tape gets damaged, mostly through crinkling. However, I also have reconstructed successfully tapes with four or more tape jams in sequence, but it is definitely better not to take this risk. Typical symptom is that the motor works but the tape stops. If that happens, immediately press CONTROL-STOP or the motor may get damaged. Reason for this failure is either too high adhesion at the guide pins or non-uniform spooling which blocks the tape reels. Best solution for both cases is to transfer the tape to another cartridge where the guide pins and the drive belt are OK. If there is too high adhesion you can try to re-lubricate the guide pins but I won't recommend that. If the tape still stucks even in the new cartridge, then there is probably some substance at the back of the tape which aggregates at the guide pins and makes the tape stuck at those pins. You can try cleaning both the back of the tape and the guide pins, but be careful not to remove the lubricant from the guide pins. For cleaning the back of the tape you can use some isopropyl alcohol on a Q-tip. But take care that the isopropyl does not get into contact with the guide pins! The tape is visibly not evenly coined up. This can affect tape transport, and you should take it seriously because it may be the pre-stage of tape jam. Reason is normally a worn out drive belt or too little adhesion at the guide pins. If tape transport is affected, transfer the tape to another cartridge where the drive belt is OK. Sometimes it will suffice to replace only the drive belt. Use the Tapetool/45 utility to re-spool the tape. If required, you also can manually spool the tape (time consuming, but feasible, I use a toothpick as tool) - just don't touch the tape with your fingers and take care for proper tape tension during the whole spool process. Place the cartridge with the aluminium plate up on the workbench. Use a Philips screw driver to remove the screws (two screws for the latest 3M types, 4 screws otherwise). Hold the plate still attached to the plastic housing and carefully flip the cartridge so that it lays with the plate down to your workbench (otherwise the cartridge interior will distribute on your desk). Lift the plastic housing vertically up. Until you are familiar with the procedure, it can be a good idea to fixate the cartridge shutter with some adhesive tape, since it easily falls from its pivot post (see below how to re-install it if that happens). When finished close the cartridge in exacly the reverse order. Make sure that the tape is tensioned (see below for tape retension) and not jammed between plate and plastic housing before re-assembling the cartridge. It can happen that you are forced to open and close the same cartridge repeatedly, e.g. due to tape jam or unspooling. It can be a bit annoying to open all screws each time again and again. In that case two screws should be the minimum. If you have a 3M from later production, you even can snap the two halfes of the plastic housing together without any screws. Tension the tape by moving both tape reels in opposite direction. If the the drive belt adhesion prevents moving, do not use force (the drive belt can tear) but use a tool like a toothpick to separate tape and drive belt so that the tape can easier move. Use the tape drive wheel to move the tape forth & back. If there is still some slack, repeat step 2. Generally, after any work on the tapes and before reassembling the tape should be tensioned in the above manner. Once the cartridge has been reassembled, it must be opened again for retensioning. Thread the tape around the the guides as shown in the drawing above. Moisten the end of the tape so that it will stick on the tape reel. Use a sharp pencil or a toothpick, guide the end of the tape between the drive belt and the reel. As you wind the tape onto the reel, ensure that there is no slack in the tape. If the tape is not tight, start over again. Wind at least 10 turns of tape onto the reel by turning the drive roller. If any rollers creep up away from the plate, press them back again. A (more detailed) description can be downloaded here. Remove the tape cartridge if installed. Clean the magnetic head with a cotton swab that has been damped with a magnetic head cleaning solution. Wipe the face of the magnetic head a few times with the cotton swab. Remove any other dust that has accumulated in the vicinity of the magnetic head. It is truly possible that you may have more than one chance to practice this procedure. The standard occasion is a lost or torn drive belt. The technique is a bit tricky, but with some practice it will be no problem at all. Obey the path of the drive belt from the tape cartridge drawing above. Place the cartridge plate-down with the drive wheel to the right. Detach the drive belt guide roller at the lower left corner from its axis and lay it aside. Turn the two tape reels in opposite direction so that the tape is not too loose. Wind the drive belt with the right orientation around the lower part of the drive wheel. Guide the drive belt through the space between the coils. Secure the drive belt with your right hand that it can't leave this space accidentally. Wind the drive belt around the drive belt guide roller in the upper left corner. Secure the drive belt with one finger of your right hand that it can't slip off the guide roller. Now grab both the second guide roller (which had been layed apart) together with the lower left loop of the drive belt between the thumb and the forefinger of your left hand and, while tensioning the drive belt, slip the guide roller carefully on its axis. You have to grab both the guide roller and the drive belt together in order not to loose one of them. Move the coils a little bit back and forth to check if the drive belt is well positioned. Then re-tension the tape as described here. Close the cartridge as described above. Sometimes, when a cartridge is open, the shutter accidentally may fall off. It is a little bit tricky to get it re-attached, but with some practice it is a matter of seconds. There is a small spring which holds the shutter in closed position until it is plugged into the tape drive. Look for that spring (probably it is anywhere in a dark corner below your desk). It has one long and one short wire end. Then look for the shutter, it has a small depression at the bottom of the hinge where the spring fits in. The depression has two tiny notches, one deeper notch and one less deep. Place the spring with the small end down into the depression, so that the small end fits into the deeper notch. Then bend the longer end until it fits into the smaller notch. Cover the top of the spring with your finger so that it can't jump out of the depression during bending. When the longer end is hooked in the small notch, carefully place the shutter over its pivot post and push it completely down. Then release the longer end of the spring by bending it out of the notch. That's it, the shutter should now be completely functional again. Very simple. Don't leave the cartridges in the tape drive if not used. Keep them in their boxes. Keep them away from magnetic fields and don't touch the tape surface. If you plan to store them for the next decade, I'd recommend to spool coins completely off and leave some message how to rethread them. By the way, the by far most durable data media are punched paper tapes and paper cards. They beat any magnetic media and even CD-ROMs for centuries. Please note that the utilities which are intended for execution on the 9845 side generally include binary programs which are not covered by the BASIC source code listings. So please execute the programs from the disk image and do not load the BASIC listings for execution.